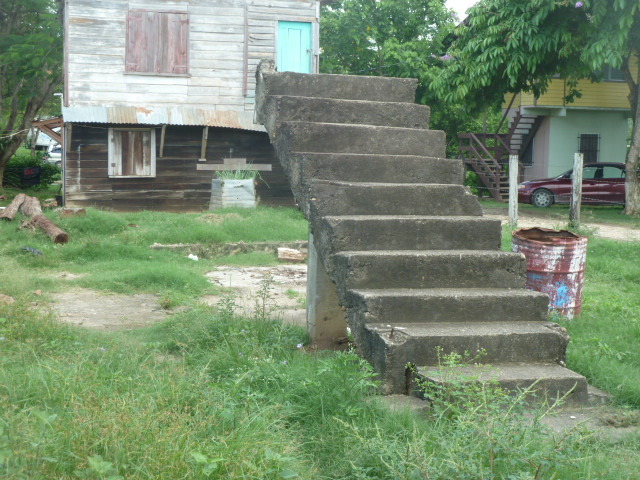 A stairway to nowhere: Poverty is a hard thing to climb out of without falling over or getting pushed back down and feeling hopeless and full of despair. Not to mention hungry or malnourished. Fortunately, my mother and her family found a church that was the “safety net” that a church is supposed to be. I’ve never been poor and hungry, or adrift in a sense of hopelessness to the point of despair, in my much-blessed life. And yet poverty has always felt personal to me. I’ve noted here before that my mother, born a mere 16 years into the 20th century, was a child when she was abandoned–along with my aunt, uncle and grandmother–by my grandfather. This tragedy, which scarred my mother for life, occurred in a dusty, rough-and-tumble Texas town when times were hard and life was extremely hard for a single, barely educated mother like my grandmother. She’d married and had a baby at 16 to escape the hardship of life on a farm operated by a typical farming man, my great-grandfather, who–as was common in those times in our nation’s history–wanted lots of children for farm labor. So my mother knew first-hand what it was like to be sleep deprived and exhausted from going to bed hungry and malnourished. She always told me that just as bad as the hunger itself was the indignity of begging for leftovers at back doors of the townspeople at mealtimes. After all, other kids from school were at those mealtime tables, and well-to-do kids can be brutal to poor kids. To make matters worse, my grandmother’s church was quite fundamentalist–all about the hellfire and not so much about the service to the poor. That church–my mother always pointed out with no small amount of lifelong bitterness–“gave us fire and brimstone.” She became a lifelong Methodist Christian because “the Methodists gave us something to eat.” The Methodists also gave my grandmother a sewing machine, materials and enough jobs as a seamstress for her and her brood to survive. Now, let me be perfectly clear. By no means am I suggesting that no fundamentalist Christians and churches ever or ever have lifted up and served the poor with the compassion of Christ. My mother’s brother, in fact, married a wonderful, Pentecostal, non-judgmental fundamentalist Christian–my beloved Aunt Newell–who lived an extremely simple and humble life, largely so that she could serve the poor. And the diligence with which she fed the poor from her garden, with which she visited took turns with people from her church visiting prisoners in the local jail and taking food to their families, with which she visited and prayed for the sick–continues to inspire me in my own ministry every day. She was a fundamentalist who had a huge, lasting impact on my life and my own ministry and she always will. My Mother, whom you should know went on to have a long and happy and, for the most part, a happy life in spite of some deep wounds caused by some toxic theology and preaching–and there is such a thing– might have been eaten up with more bitterness had she never seen the witness to Christ that my fundamentalist aunt was. Proving once again that God indeed works in some strange, mysterious ways in this poor, broken and ever sin-sick world. Really powerful and evocative writing here. Hey buddy, I enjoyed learning more about your family dynamics. I still would love to have more of these discussions face to face.